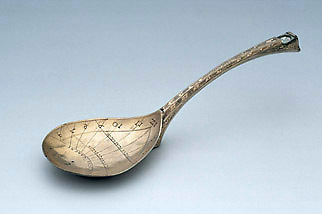 There was much ingenuity in the design of sundials around the 16th century and this idea is both original and extremely rare; it is the only known example of a sundial in the form of a spoon. The hour lines are engraved inside the spoon, where there is also a hole for a pin gnomon (missing). In use (as a sundial) the spoon would have to have been aligned north-south and there is a space for a tiny magnetic compass at the end of the handle, though the compass itself is missing. The spoon is gilt and finely decorated.